Demi, the small-scaled sibling to Spoon and Stable and Bellecour, is scheduled to open in mid-February. 1. Demi has an opening date. 2. All seating will be made via prepaid online reservation. 3. The reservation pool is opening, soon. The online service will commence the first week of February. “Our goal is to charge $95 for the 2-hour experience, and $125 for the 2 1/2-hour experience,” said Kaysen. 4. Demi will be up-close-and-personal dining. 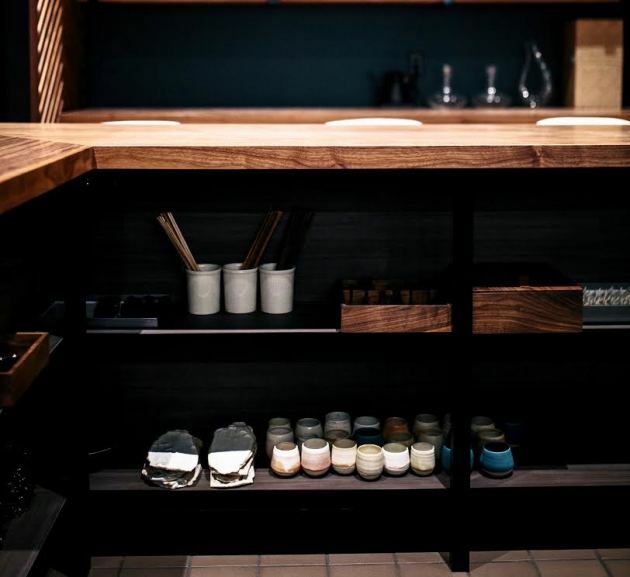 Much of the cooking at the 20-seat restaurant will be performed in front of guests, who will be seated at a 20-seat, U-shaped counter that surrounds a cooking station and is flanked by a second cooking line. “I’ll be here a lot, because this is your dream as a cook, to be this close to people,” said Kaysen. There will be a ratio of two guests per one member of the staff. “The whole intention is that the cooks have to know how to serve, and the servers have to know how to help the cooks,” said Kaysen. 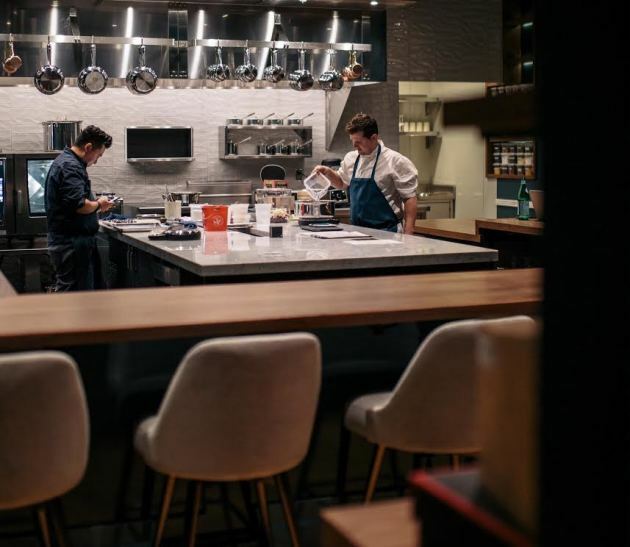 “Everybody is equal.” The team is headed by Spoon and Stable veterans, including chef de cuisine Adam Ritter and general manager Tristan Pitre. 4. The 1,200-square foot space was designed by Linda Kaysen — she’s Kaysen’s spouse — and Shea Design, the Minneapolis firm behind the look of Kaysen’s two four-star properties, Spoon and Stable and Bellecour. 5. The restaurant is peppered with plenty of artist-designed details. Kaysen’s brother Sean Kaysen crafted beautiful wood service trays and boxes, including sleek storage containers for the custom steak knives that were created for the restaurant by Jackson Schwartz of Hennepin Made in Minneapolis; the knives’ handles were fashioned from a tree on nearby Nicollet Island that was felled by lightning. The delicate, one-of-a-kind ceramics — made by Chicago potter Ashley Lin — just might make the restaurant’s dishwasher the most valuable person on the payroll. (Provided photos, above, by Libby Anderson). 6. The place is subtly steeped in history. The building dates to the late 19th century, and the original tenant, the Barrington Hall coffee company, is referenced throughout. Sean Kaysen fashioned parts from three coffee roasters into the planters that greet guests on the sidewalk. After Barrington Hall invoices and brochures were discovered in the building’s attic, Twin Cities artist Laurie Borggreve cleverly incorporated some of their elements into a memorable artwork that graces the dining room. 7. There’s a poetic side to the restaurant. Nice, right? “At one point, we talked about calling the restaurant ‘Lucile,’” said Kaysen. 8. Demi was designed to be conversation-friendly. 9. The menu will change frequently. 10. The restaurant is located on the same North Loop block as Spoon and Stable; they face one another across an alley.